Stigma is the shame or blame caused by false, unfair or negative beliefs that some people have about something that they don't understand - like mental illness. Most mental health disorders can be diagnosed and treated, but stigma often keeps people from getting the help they need. Thirty-two million people in the US, or one out of ten people, live with an untreated mental health disorder. Many people don’t seek help because of the fear and shame associated with stigma! This shame can make people afraid to say that they have a mental health disorder, or that someone they love has a mental health disorder. Stigma can result in shame and/or blame: shame that someone will find out and will think badly of the person and/or family and blame that someone (self, parent, friend) is responsible for somehow causing the mental health disorder. The consequences of stigma can be very serious. Instead of seeking treatment, people who are struggling with the symptoms of a mental health disorder often live in silence. They may fear for their jobs and the acceptance and understanding of their loved ones. Consequently, they tend to not talk openly about what they are experiencing. Therefore, people with mental health disorders often suffer twice, even though they have not done anything to cause their illness. People who do not understand mental health disorders can make unkind or insensitive remarks. This is hurtful and contributes to stigma and shame. Myths, misunderstandings, and the media often portray those with a mental health disorder as being "crazy" or dangerous. However, the truth is that people with mental health disorders are no more violent than anyone else. Most people who live with mental illness have, at some point, been blamed for their condition. They’ve been called names. Their symptoms have been referred to as “a phase” or something they can control “if they only tried.” They have been illegally discriminated against, with no justice. This is the unwieldy power that stigma holds. Stigma causes people to feel ashamed for something that is out of their control. Worst of all, stigma prevents people from seeking the help they need. For a group of people who already carry such a heavy burden, stigma is an unacceptable addition to their pain. And while stigma has reduced in recent years, the pace of progress has not been quick enough. 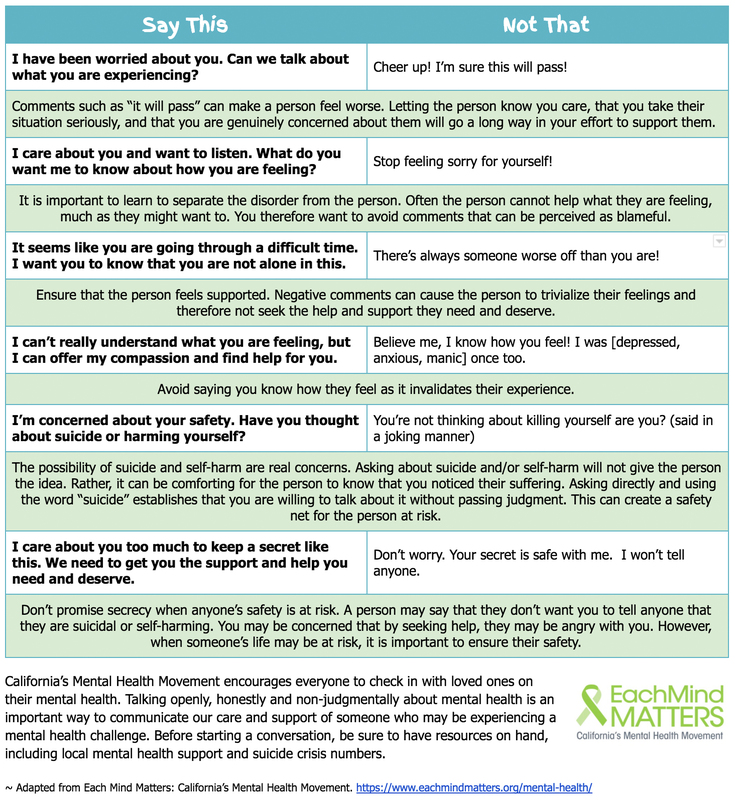 DO allow your friend to talk about his or her mental health diagnosis. DO NOT give advice or try to make it seem that their concerns are not real or are just a phase. DO NOT share your friend's personal information, thoughts or feelings with others, unless your friend intends to hurt himself/herself or others, then call 911! Don't give up if your friend pulls away. People with mental health disorders sometimes withdraw from family and friends. Understand that this may happen because they are scared and that their brain is not working the way it used to. Therefore, it is important to keep trying to spend time with them by hanging out, studying or just talking. Doing this may help them realize that you are there for them and that you care. Learn as much about mental health disorders and wellness as you can. Knowledge is powerful and can help you to know what you might expect from your friend. Help bust stigma by educating friends and family about mental health disorders. Your words matter! Everyone deserves to be treated with kindness, understanding, and respect, NOT with negative, judgmental, or hurtful words. 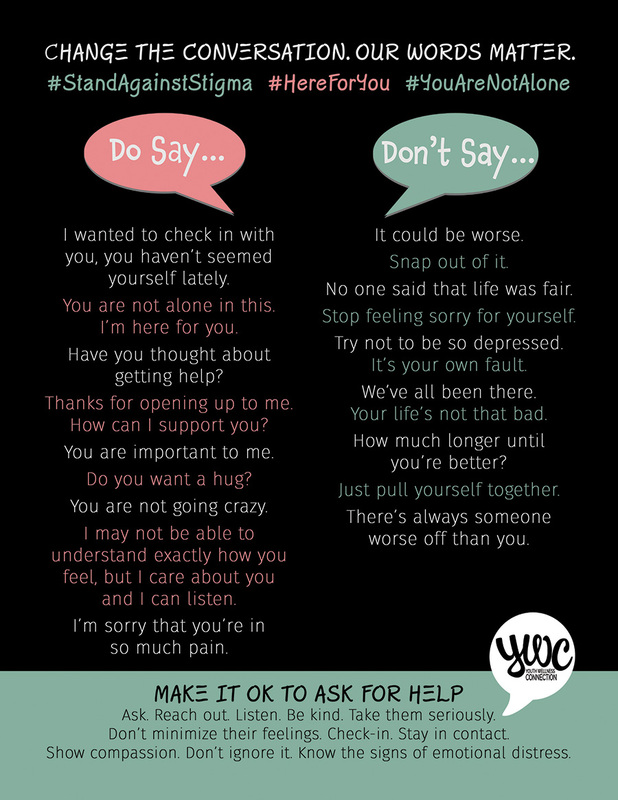 Think about what you might say and how your friend might feel. It's the illness that causes these thoughts and feelings. I may not be able to understand how you feel, but I care about you. I am here for you. We will get through this together. This must be really difficult for you. Shouldn't you be better by now? You want to reassure your friend of your support and understanding. Educate yourself about mental health problems. We all have grown up with prejudices and judgmental thinking. Does any speaker say something, which you feel is especially important to you personally? How might misunderstanding something like mental health disorders contribute to stigma? 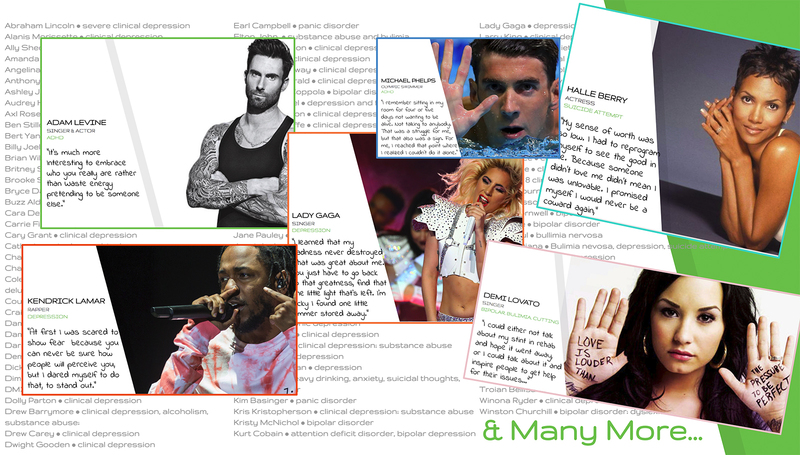 What could you do to stop the stigma of mental health disorders?